Janice Wallace, an expert in care giving and maintaining the elderly at home. •	Women’s role as caregivers when helping parents, other loved ones or friends as they age. •	How can we be caregivers and retain some semblance of a personal life? •	How can we set the stage for our own future? •	How to make a home suitable for aging persons. You can RSVP directly to Janet Crane at jcrane@f-sc.com. Patty Haight can be reached at @ 415.939.4140 for any questions/additional information or if you are having issues with registering. 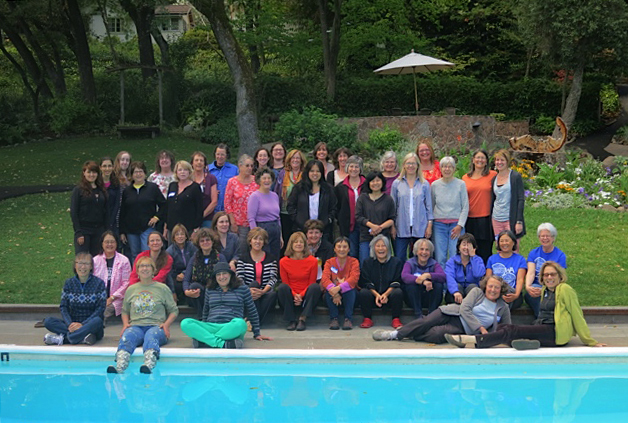 Please join us at this year’s weekend retreat at the beautiful Westerbeke Ranch in Sonoma. “Empowering Improvisation" is this year's theme: a workshop designed to help you think on your feet in professional and social situations. This promises to be entertaining and instructive! For the art project, Judy Rowe and Mui Ho will provide means and methods for fabric dying and decoration. On Saturday night, we will celebrate with live music and dancing with the Baguette Quartette and French cafe music. A yoga session as been arranged for Saturday, and on Sunday, an “eccentrics” stretching class will conclude the program. We very much hope you will join us for a stimulating and relaxing weekend! Please contact Janet Crane, jcrane@f-sc.com or 415-398-4094, to make a reservation and then send in the form on the attached invitation to Heather Sprague. Details of the retreat are on the invitation and sign up form. 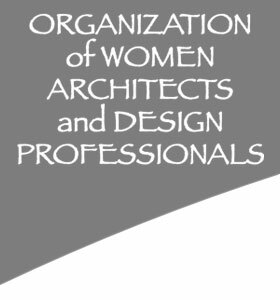 •	Improve the professional standing of women in architecture and design-related fields. •	Promote networking opportunities among our members and related professional groups. •	Provide support for women entrepreneurs and business owners in the design industry. •	Advocate young women and students entering design related fields through mentoring, education, and employment opportunities. •	Support women in creating a healthy balance between their professional and personal lives. Please write "2014 Membership Your Name" in the subject line. 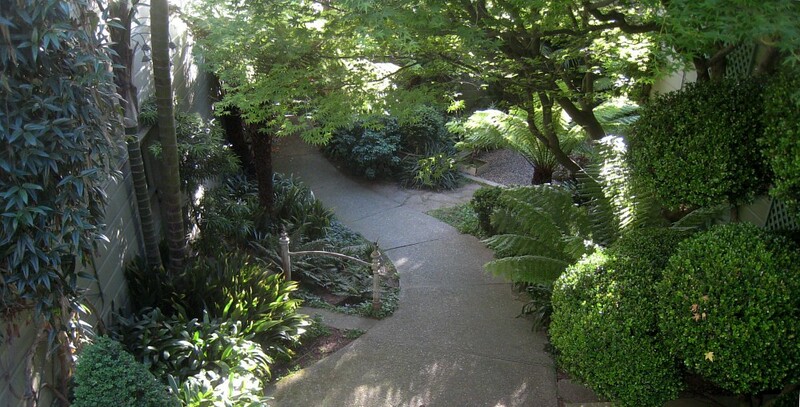 We had a good turnout for our May program where we enjoyed a tour of the San Francisco home and gardens of renowned Landscape Architect Thomas Church and a talk and discussion led by current home owner and historic preservationist Courtney Damkroger. A clear, warm evening allowed attendees to mingle and to leisurely explore the grounds. 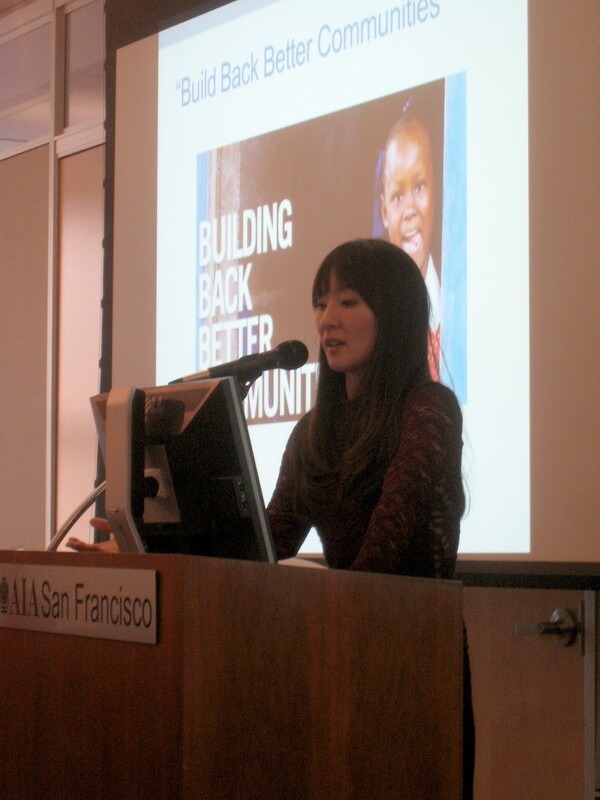 OWA and San Francisco AIA Mentorship Committee co-hosted our May 21 event, Learning from Urban Disasters: Rethinking the Role of Architects in the 21st Century, a very successful evening of discussion and presentations led by Alexandra JaYeun Lee, PhD, Visiting Research Scholar, Institute of Urban and Regional Development, University of California Berkeley, and The University of Auckland. Alex founded the regional chapter of Architecture for Humanity in New Zealand in 2007 and led it for six years, giving her a good window on the world, and she is active in Architecture + Women New Zealand. She and her husband Alexei Dunayev at TranscribeMe, a global tech-start up based in Berkeley, have been living this year in Point Richmond. Wendy Bertrand, a founding member of OWA, introduced to the approximately 50 attendees, the program and our organization, initiated 40 years ago and having members who connect across a variety of design professions and a wide range of ages and stages in their careers. Wendy described meeting Alex at a UC Berkeley Conference about social factors in architecture in 2011 and how, when she learned that Alex would be in the area, she wanted to bring Alex’s academic work to the attention of OWA. When Wendy mentioned this to Jean Nilsson and learned that Jean was just completing a Gulf Coast hurricane-recovery project, she wanted to include a look at that unique project in the program. 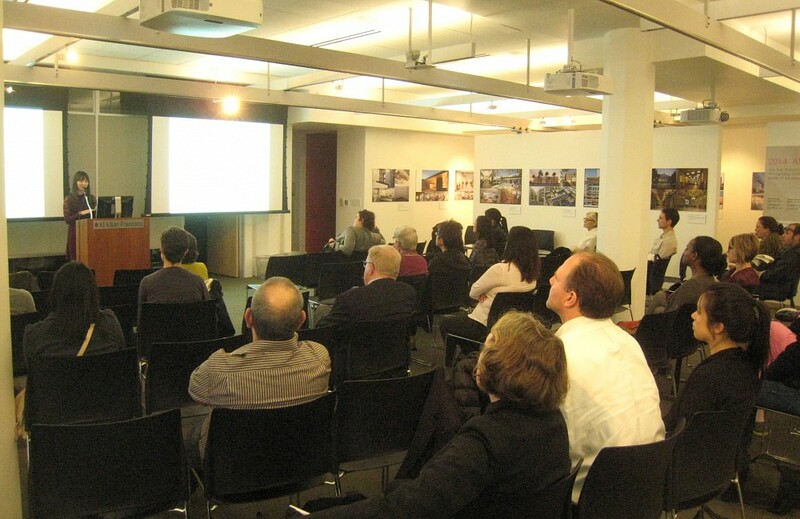 The OWA Program coordinators worked to set up this extra May meeting with AIASF’s Mentorship Committee Co-Chair, Daniel Perez, and he gave a pitch for their AIA mentorship program which is open to OWA members. Wendy launched into the topic by asking all attendees to introduce themselves, emphasizing the value of telling and listening so that one may be able to know and support each other, and she asked people to include their disaster experience, which set the stage for discussion to follow. Several people had been involved in disasters or in recovery work. Jean prefaced Alex’s presentation with a concise and well-illustrated presentation of her personal account of the disaster recovery housing work she had completed in Galveston, TX following Hurricane Ike in 2008 (article below). Alex presented her “social disaster architectural research”, including a look at the importance of resilience (often lacking in dense urban places) and the architect's role in disaster situations, especially in translating the social concerns of the people involved. She discussed her research, which she focused on Christchurch, NZ (2011 earthquake), New Orleans, LA and Biloxi, MS (2005 Hurricane Katrina), and Port-au-Prince, Haiti (2010 earthquake). Alex made connections among a thought-provoking array of disaster issues for architects and other citizens: design equity; top-down vs. bottom-up rebuilding; “Build Back Better”; affordable, sustainable and local priorities; displacement, transitional architecture, temporary housing camps and toxic trailers, corruption and blame; prototypes and competitions; community-led activism, participatory design and volunteers; houses vs homes and real communities; humanitarian design and the role of gender in social resilience. “Disasters amplify social, environmental, political problems. Disasters are interdisciplinary; it’s everyone’s business; architects are missing,” Alex noted. She referred to Horst Rittel’s concept that design is an activity that is “intended to bring about a situation with specific desired characteristics without creating unforeseen and undesired side and after effects”. Using carefully selected images she illustrated some of the Wicked problems (as a contrast to tame problems that are linear and predictable in nature) that she found in her experience as well as research of eight years. She is currently working on a book that will evolve from her knowledge and concern for the need for architects to participate early and be sensitive to the long term needs resulting from disasters. While the 6pm start time at the downtown AIASF office proved to be a challenge for many–leading to a late start to the program–the early group enjoyed meeting each other over bountiful handmade sandwiches, farmers market vegetable treats, and drinks provided by OWA. At 8pm, we were required to close down a very active discussion, which a dozen participants continued on the sidewalk in front of the AIA office for another half-hour. Jean Nilsson Architect, Asilomar Conference, California Preservation Foundation photo. As a preface to Alex’s scholarly work in learning from urban disasters (article above), I shared a brief personal story of my recent experience in disaster recovery work on the Gulf Coast of Texas, based on a slideshow I had given at California Preservation Foundation's April Conference at Asilomar. Over six years and 16 trips to Galveston since Hurricane Ike–the 100-year storm that in 2008 damaged 75% of the island’s housing–I have been advocating on behalf of preserving the older houses and respecting the character-defining features of the old neighborhoods as key aspects to successful disaster recovery work. 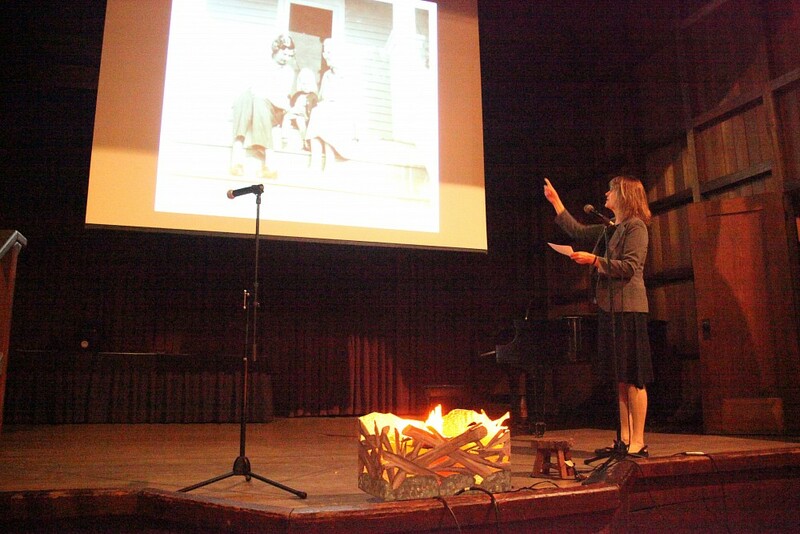 My presentation illustrated the process of saving a particular 1926 historic house that my grandmother bought in 1938 and that my mother lived in from 1948 until four days after the hurricane. The house was deemed eligible for rehabilitation under the Disaster Recovery Housing Program, with federal CDBG funds, but due to complexities of the historic context, the program’s budget constraints, and the bureaucratic morass, the house kept getting pushed to the bottom of the rehabilitation list. The house needed significant repair after Ike to address storm damage, HUD and code upgrades, and deferred maintenance, all covered under the program. All exterior work was subject to State and Local historic regulations and review due to its location in the East End Historic District (EEHD), a neighborhood listed in 1978 on the National Register of Historic Places, along with the adjacent historic downtown. In the late 1950s, my father had made alterations to the house to accommodate a Radio and TV Repair business, obscuring the house’s original character and resulting in it later being classified as having an “adverse effect” on the district. My challenge was to find a happy medium between the seemingly conflicting requirements of the program, in terms of scope and budget, and an approach that the Texas Historical Commission would approve as meeting the Secretary of the Interior’s Standards in order to reclassify the house as "contributing" to the EEHD and to grant a windstorm exemption. I sought the support of local preservationists, politicians, City and State officials, and neighbors, as well as colleagues in California and Texas. In the face of repeated setbacks and denials, including the program's formal request to demolish the house, I persistently continued to refine my case to establish the house’s integrity and its value to the neighborhood in terms of architectural and cultural history and the story it tells of change over time. Backed by historic research and documentation, including my grandmother's immigration record, Sanborn maps, property histories, and family photographs from the 1930s -1950s, as well as original building components salvaged from debris of the storm, I developed design options that I successfully argued would meet all parties’ requirements. Block in historic district with early houses built in 1870s (corner and left in photo) and infill in 1920s, including 1926 house to right of corner, renovated as part of disaster recovery work.